Ask fellow campers about "Kenai Princess RV Park" and nearby attractions. Nice park next to the Princess lodge. You have access to the lodge amenities, unfortunately the lodge took out the hot tub but there are other things to do. Utilities worked well, cable signal gets weaker during the evening as more tie into it. Wifi is slow but consistent. They are starting to relevel their sites with new gravel which is good as both times we stayed the sites we had to use 2" blocks to level. We camped at Kenai Princess RV Park in a Motorhome. 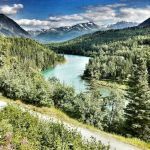 Kenai Princess RV is one of the best RV parks we've found in Alaska. 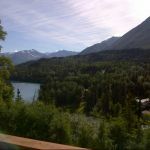 It is located at a bluff above the Kenai River with full access to the Main Resort lodge and facilities. They have 2 restaurants with a deck overlooking the river. There is also have a small workout room and a jacuzzi (which was closed due to repairs when we were there). The road is gravel and you do have to make a rather tight turn at the end, but even with a very long rig we managed it. Being off the main highway is great as it is very quiet (no trains, planes or automobiles). We've been able to get Dish satellite almost everywhere in Alaska, but not here due to the trees and mountains. They supply cable TV though (about 20 channels); our reception wasn't very good at first but my husband cleaned the connectors at the post and it worked fine. The free Wifi is generally good. One of My husband's favorite features is that it is very close to fishing in the Kenai and Russian Rivers, so he went almost every day (and came home with about 40 pounds of salmon......wooohooo!). One note is that the fire rings are portable, and there are only 2, so reserve one early. We'll definitely come back. We camped at Kenai Princess RV Park in a Fifth Wheel. Eat at the Kingfisher Roadhouse on the Sterling Hwy (east of the RV Park several miles). It doesn't look like much from the road but is quite interesting and VERY Alaskan. Fish on the far side of the Kenai by taking the Ferry across and walking to the right a bit. They accept the America The Beautiful National Park pass so parking & the ferry are 1/2 price. A nice campground with fine hosts that are very helpful. Verizon hardly had any service at all. The laundry is a busy place as many community people use it. They do not have a website or direct phone number which made communication very difficult. Utilities worked just fine. We camped at Kenai Princess RV Park in a Travel Trailer. Beautiful area on the Kenai Peninsula. Many rafting trips available. We used Kenai Riverdog, owned by Kayce, a grand tour guide with a catamaran raft that was very stable. The lodge is just up the road with grand views and food and gift shop available. 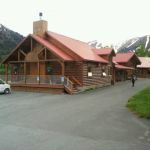 We stayed here because it was close to river raft trip we took on the Kenai River. It's a busy spot below the lodge but the back in sight we had left plenty of room between campers. The view from the lodge was nice, and mountains surrounding it. There is a decent pub to have dinner as well. The wifi was better by lodge but okay at our camper - again not so fast in the wilderness. The grassy/woods beside camper was good for our dogs. We camped at Kenai Princess RV Park in a Fifth Wheel. If you can get a site to stay there, we recommend a 2 hour float trip with Alaska River Adventures. The locals who run it were extremely friendly and even though there was only two of us, they took us anyway...and they do go rain or shine but provide adequate weather gear. Our guide was awesome and we really enjoyed our time. The launch is just across the bridge from the turn to the campground. Location is great, totally quiet with mountain views. Site was level and easy to access. All hookups were convenient, although power was a bit low due to folks running ac. Small campground, sold out the entire time we were there so make reservations. The only campground we have seen where you are welcome to wash your rig in your site, so bring your brushes. Lodge right up the hill with awesome deck overlooking Kenai River, rocking chairs, bar/grill area with deck seating and a menu with prices comparable to everywhere else we have been in Alaska. Very welcoming staff at lodge and campground. Wifi ok, not great. Verizon reception mediocre. Cable great. Would definitely return to the campground or lodge. We camped at Kenai Princess RV Park in a Motorhome. Definitely walk up to the deck at the lodge and enjoy the view. River float trip was relaxing and beautiful; find a way to get out on the river. Russian River Falls trail takes you to a viewpoint to see the salmon jumping; easy walking but 2.3 miles each way. Lots of fishing opportunities. Beautifully located and very quiet. Level sites, fairly roomy, good wifi and phone service. Laundry was $2 a load - the lowest price we have ever paid per load. 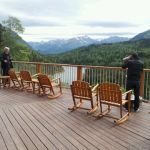 The best part was going up the short trail to the lovely rustic Kenai Princess ( yup, the cruise line) Lodge where we enjoyed sitting on the deck with a stunning view of the turquoise Kenai River and huge, steep mountains. They have a full bar and excellent food. Very friendly staff - they ALL seemed to like their jobs. RV park guests are welcome there. We are going back. We camped at Kenai Princess RV Park in a Travel Trailer. We took a float raft trip with a local company and really enjoyed this gorgeous part of Alaska. Have a meal or a drink at the Kenai Princess Lodge. Excellent food and staff. Nice park near best salmon fishing and bear viewing. 30 amp full hookup level back-in sites. Good WiFi and cable. Beautiful views and nice trails. Note: pretty sharp entry with sizable downhill. We camped at Kenai Princess RV Park in a Motorhome. Nice campground near Kenai River, with great mountain views. Fairly level, gravel sites (not too tight) with hookups, cable and working WiFi. OK to wash your RV at site. Clean laundry with large front-load washers & dryers for only $2. Room to walk our dogs. We would stay here again. We camped at Kenai Princess RV Park in a Fifth Wheel. First, be careful using the milepost,,, need to drive to Cooper Landing it's in the city. There's a sign for it 2 miles of the Sterling. Nice setting right on the Kenai River. No fishing though have to go to the Russian River area or into Soldotna. We drove down from Denali. Long drive. Lady working the desk was very friendly. Showers were ok, not the nicest, but acceptable. Sites were good, full hook-ups, cable and wifi very good. Would stay again. We camped at Kenai Princess RV Park in a Motorhome. Very nice park in a scenic setting just off the Kenai River. Great host lady took care of us and gave us all the scoop on amenities and the surrounding area. Park has a cul-de-sac at the end in order to turn your rig around since all the sites are back in. The park also permits washing of vehicles, one of the few we encountered in all of Alaska. RVers are also allowed use of the lodge facilities such as the restaurant and hot tub, a nice touch. We would definitely return. We camped at Kenai Princess RV Park in a Motorhome. This small park is very nice (for Alaska). The sites are decent size; hookups worked well for us (site 9), but we could see that some sewer drains were tall or less well placed. It was peak sockeye season (end of July first of Aug) and the camp was completely full on the weekend. A bonus is that RV campers can use the hot tub up on the hill above the Princess Lodge, with a $5 refundable key deposit. We took showers up there after hot tubbing and did not use the pay ones in the park. Staff was friendly. We stayed four nights on our way south towards Homer and again one night as we headed north. Perhaps a bit pricey, but worth it. We camped at Kenai Princess RV Park in a Motorhome. Rate reflects Good Sam discount. I basically agree with previous reviewers. Hook-ups work fine. The only thing I would add is that the sewer hookup is at the very rear of the site (all sites are back-in) so make sure you have extra sewer hose. We would definitely stay here again. We camped at Kenai Princess RV Park in a Fifth Wheel. For a small park with only 29 sites, it is very busy. The park has cabins at the end that are full time tenants (maybe Princess employees?). There are a couple of highway workers living on property. The weekdays are pretty quiet, the weekends are chaotic with fishermen and kids. The hosts are very nice and helpful. The sites are level, the wi-fi is fine, the cable is network channels and works fine. The sites are wide enough for your rig and we could park the toad next to the coach. We would stay here again. The lodge up the hill has good restaurants, exercise room, hot tub, and trails to enjoy. We camped at Kenai Princess RV Park in a Motorhome. Very nice park with friendly host, they even have a small book exchange. Princess Wilderness Lodge is up the hill in walking distance overlooking the Kenai River. Beautiful setting, would stay here again. We camped at Kenai Princess RV Park in a Motorhome. Beautiful setting! Close to the Princess lodge, gift store, etc. Unsecured Wi-Fi works great, and Verizon cell service is good. Wide spaces for RVs. However, the street we entered on is one-lane with vehicles parked along it sideways in front of their rigs. Getting a big fifth-wheel in was TIGHT! The laundry room has 6 washers & 6 dryers, small folding table. Would be fine for RV park guests but locals come in and use it, too. Seems to be the only show in town. Too many people using this small facility to make it easily accessible for guests of the park. We would stay here again. We camped at Kenai Princess RV Park in a Fifth Wheel. We took a float raft trip with a local company and really enjoyed this gorgeous part of Alaska. Have a meal or a drink at the Kenai Princess Lodge. Excellent food and staff. Are you affiliated with Kenai Princess RV Park ?